Getting dressed each morning is a simple, routine act, but the process of making many of the clothes that fill our closets is anything but. Even to create a typical colored T-shirt, the fabric manufacturing and dyeing industry relies heavily on the use of salt, alkali and other chemicals, a process that creates substantial waste and can involve high energy and water consumption. As you can imagine, this process poses significant environmental risks. As an associate professor of Textile Engineering, Chemistry and Science at North Carolina State University, I’ve worked with a team of graduate students for five years to find a better solution. Recently, we arrived at a breakthrough: a fabric treatment that reacts with a foam dye that looks a lot like shaving cream. As fabric is passed through foam-lined machines, this foam dye can be applied to either one or both sides of the fabric. In streamlining this process, we developed an accompanying fabric with a unique chemistry. 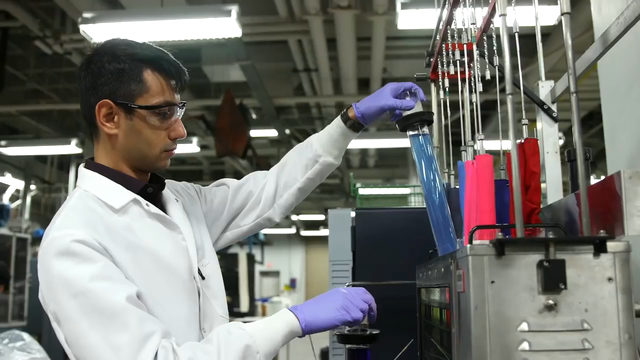 Embedded with a tremendous number of dye sites that act as magnets and capture the pigment passed from the foam, the fabric used in this chemical connection is fully colored in a matter of minutes and doesn’t require rinsing, washing or drying. Instead, the end product is placed inside a steamer, minimizing the dependence on energy, water and chemicals while eliminating the messy parts that come with the dyeing process. While our dyeing process is seeing considerable advancement, we’re also working to better understand a related matter: creating color constancy. What does this mean? When dealing with different dyes and fabrics, colors often change depending on light sources. For instance, if you see clothing in a store that you like because of a specific color, you may find that it looks different under the store’s fluorescent lights than when you wear it out in daylight. This month, our research got a boost as our team at NC State was included among five other research and academic institutions receiving grants from the Walmart U.S. Manufacturing Innovation Fund. This funding will help us develop a database of hues, shades and depths that are color-constant. From there, the end product will be something consumers will be pleased to buy without any unexpected surprises. Our hopes are that potential investors will recognize the value of these improved methods and, over the long term, be inspired to help relocate textile manufacturing back to the U.S. The truth is, it’s all still in progress. However, I am confident our work will soon be opening doors, not only in the textile industry, but in other coloration industries around the world.